How exactly does OpenGL do perspectively correct linear interpolation? If linear interpolation happens during the rasterization stage in the OpenGL pipeline, and the vertices have already been transformed to screen-space, where does the depth information used for perspectively correct interpolation come from? Can anybody give a detailed description of how OpenGL goes from screen-space primitives to fragments with correctly interpolated values? Clip coordinates for a vertex result from shader execution, which yields a vertex coordinate gl_Position. Perspective division on clip coordinates yields normalized device coordinates, followed by a viewport transformation (see section 13.6.1) to convert these coordinates into window coordinates. This transform is bijective, so no depth information is lost. In fact as we see below, the 1 / gl_Position.w is crucial for perspective correct interpolation. All math can be done using the above parametrization, and in fact is sometimes preferable due to faster calculations. However it is less convenient and has numerical issues (e.g. P(1,0) might not equal P1). where b0 + b1 + b2 = 1, b0 >= 0, b1 >= 0, b2 >= 0 are the barycentric coordinates of the point in the triangle. Each bi can be thought as 'how much of Pi has to be mixed in'. So b = (1,0,0), (0,1,0) and (0,0,1) are the vertices of the triangle, (1/3, 1/3, 1/3) is the barycenter, and so on. So let's say we fill a projected 2D triangle on the screen. For every fragment we have its window coordinates. First we calculate its barycentric coordinates by inverting the P(b0,b1,b2) function, which is a linear function in window coordinates. This gives us the barycentric coordinates of the fragment on the 2D triangle projection. Perspective correct interpolation of an attribute would vary linearly in the clip coordinates (and by extension, world coordinates). For that we need to get the barycentric coordinates of the fragment in clip space. As it happens (see  and ), the depth of the fragment is not linear in window coordinates, but the depth inverse (1/gl_Position.w) is. Accordingly the attributes and the clip-space barycentric coordinates, when weighted by the depth inverse, vary linearly in window coordinates. and then use it to interpolate the attributes from the vertices. Note: GL_NV_fragment_shader_barycentric exposes the device-linear barycentric coordinates through gl_BaryCoordNoPerspNV and the perspective corrected through gl_BaryCoordNV. // discard fragment outside the triangle. this doesn't handle edges correctly. Here are the OpenGL shaders used to generate the reference image. where a,b,c denote the barycentric coordinates of the point in the triangle we are interpolating for (a,b,c >=0, a+b+c = 1), f_i the attribute value at vertex i, and w_i the clip space w coordinate of vertex i. Note that the barycentric coordinates are calculated only for the 2D projection of the window space coords of the triangle (so z is ignored). This is what the formulas that ybungalowbill gave in his fine answer boils down to, in the general case, with an arbitrary projection axis. Actually, the last row of the projection matrix defines just the projection axis the image plane will be orthogonal to, and the clip space w component is just the dot product between the vertex coords and that axis. In the typical case, the projection matrix has (0,0,-1,0) as the last row, so it transfroms so that w_clip = -z_eye, and this is what ybungalowbill used. However, since w is what we actually will do the division by (that is the only nonlinear step in the whole transformation chain), this will work for any projection axis. It will also work in the trivial case of orthogonal projections where w is always 1 (or at least constant). Note a few things for an efficient implementation of this. The inversion 1/w_i can be pre-calculated per vertex (let's call them q_i in the following), it does not have to be re-evaluated per fragment. And it is totally free since we divide by w anyway, when going into NDC space, so we can save that value. The GL spec does never describe how a certain feature is to be implemented internally, but the fact that the screen space coordinates will be accessible in glFragCoord.xyz, and gl_FragCoord.w is guaranteed to give the (lineariliy interpolated) 1/w clip space coordinate is quite revealing here. That per-fragment 1_w value is actually the denominator of the formula given above. Not the answer you're looking for? Browse other questions tagged opengl projection fragment-shader linear-interpolation pixel-shading or ask your own question. 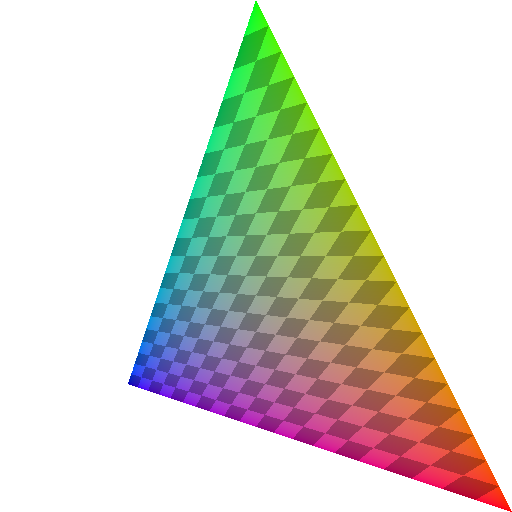 Opengl uvw projection, what's under the hood? Why does GL divide `gl_Position` by W for you rather than letting you do it yourself? How does OpenGL map an image to a quadrilateral? When does the transition from clip space to screen coordinates happen? Gamma correction doesn't look properly corrected, is this linear?